Julie A. Y . Cichero, Private Speech Pathology Consultant, Brisbane, Australia. Bruce E. Murdoch, Professor and Head of Department of Speech Pathology and Audiology, The University of Queensland, Australia. Part I: Foundations of Swallowing. 1. Applied anatomy and physiology of the normal swallow (Jonathan Cichero). 2. Swallowing from infancy to old age. (Julie Cichero). 3. Variations of the normal swallow (Julie Cichero and Peter Halley). 4. Respiration and swallowing (Julie Cichero). 5. Medical management of patients at risk of aspiration (Rod Brockett). 6. Saliva management (Hilary Johnson and Amanda Scott). Part II: Assessment of Swallowing Disorders. 7. Clinical assessment, cervical auscultation and pulse oximetry (Julie Cichero). 8. Imaging assessments (Julie Cichero and Susan Langmore). Part III: Aetiologies and Treatment of Adults with Swallowing Disorders. 9. Conditions commonly associated with dysphagia (Julie Cichero). 10. Developmental disability and swallowing disorders in adults (Justine Sheppard). 11. Improving swallowing function: compensation (Julie Cichero). 12. Swallowing rehabilitation (Julie Cichero). Part IV: Aetiologies and Treatment of Children with Swallowing Disorders. 13. 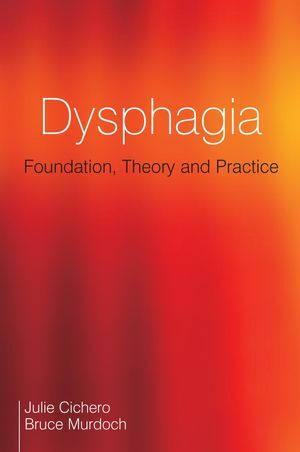 Clinical signs, aetiologies and characteristics of paediatric dysphagia (Angela Morgan and Sheena Reilly). 14. Assessment techniques for babies, infants and children (Nathalie Rommel). 15. Management of paediatric feeding problems (Sarah Starr). Part V: Measuring Outcomes of Swallowing Disorders. 16. Oropharyngeal dysphagia outcome measurements (John Rosenbek and Neila Donovan).